Kids can “fill-up” their gas tank! Kids can “fill-up” the gas tank just like mom and dad with their very own Little Tikes™ Cozy Pumper. The Cozy Pumper has weatherproof buttons and sounds that stimulate interaction. Use it next to your playhouse to create a pretend town. This pretend gas pump can be used indoors or out. The perfect complement to any Little Tikes ride-on toy and it’s designed with weatherproof electronic buttons. 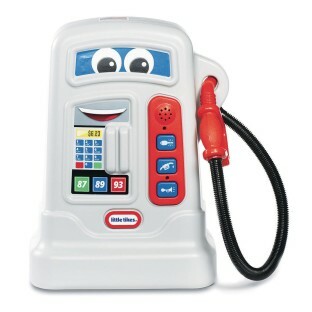 Encourages imaginative play with three fun car sounds and the pretend gas pump hose with pretend nozzle. Nozzle stores on the side of the pumper. Requires 2 “AA” alkaline batteries (not included). Measures 14” x 15” x 17-1/2”.